FRAMED PRINT. 22x18 inch (56x46cm) Framed Print with Black Satin with Off-White Digital Mat. 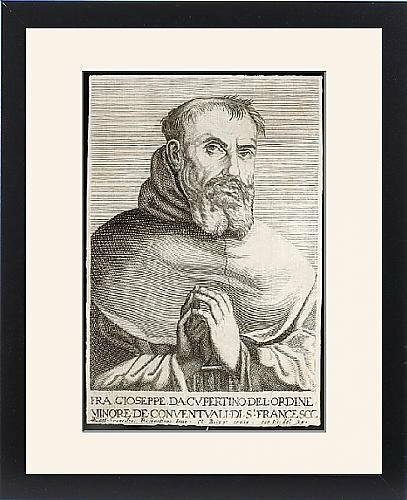 Artwork depicting ST JOSEPH OF CUPERTINO. Guiseppe da Cupertino (1603- 1663) the flying friar . His birth mirrored that of Christ. A devout boy he entered the Francisan order a the miraculous levitations began. Shipping from USA. Artwork Description... Guiseppe da Cupertino (1603- 1663) the flying friar . His birth mirrored that of Christ. A devout boy he entered the Francisan order a the miraculous levitations began.